Saturday was a fun day. I hit the road for a shoot down in Lake Samish south of Bellingham, Wash. The 34th annual Lake Samish Swim. It’s not a big crowd draw but it was fun to shoot. Challenging, yet fun. I’ll post something Thursday about it. Then after that, I headed to Squalicum Harbor to meet with the organizers of the 2014 Bellingham Youth Regatta. I called on Friday to secure a place on a boat. This was so I didn’t shoot from shore and get a lot of relatively lame, distant photos. Both assignments for The Bellingham Herald. Forgive me if I get the sailing nomenclature wrong. I was in the Navy, but my ship was huge and we used different terms. I was also an electrician, not a boatswain’s mate. 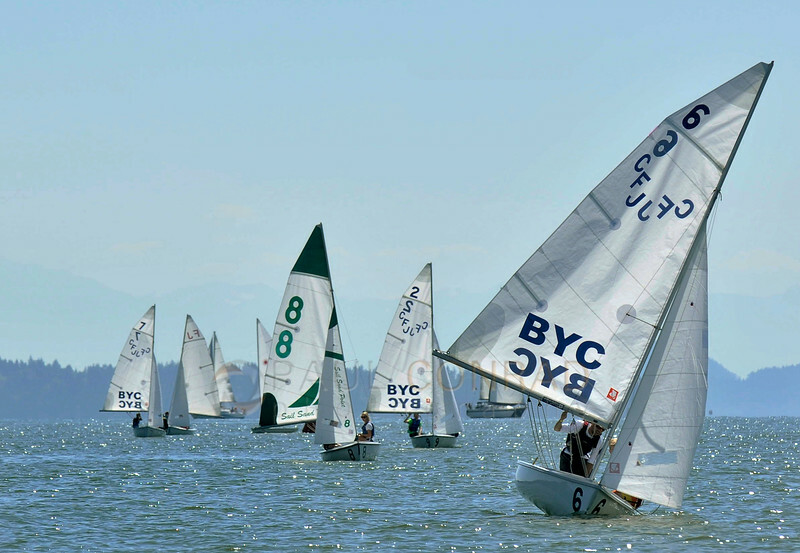 © Paul Conrad/The Bellingham Herald – Racers in the FJ class turn towards the second marker after completing their turn from the first during the annual Bellingham Youth Regatta on Saturday afternoon August 9, 2014, on Bellingham Bay in Bellingham, Wash.
From the shore, I wouldn’t have been able to get any good images. Especially close-ups showing the faces of the competitors. 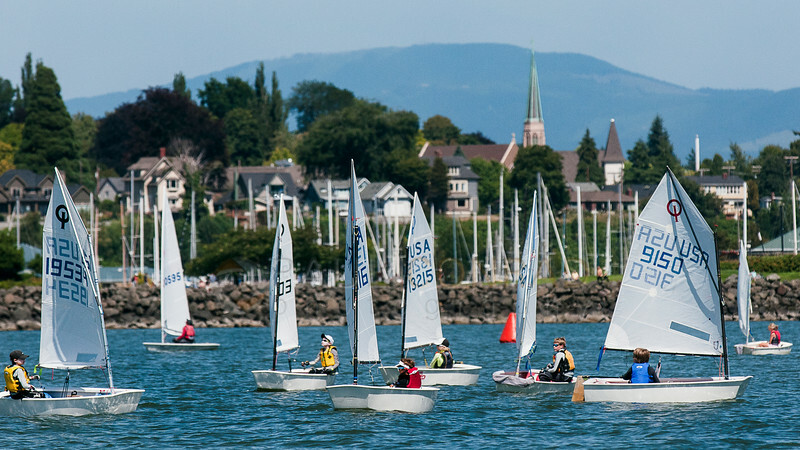 The regatta was held pretty much in the middle of Bellingham Bay. I would’ve needed a super-telephoto lens to even get close. I’m glad I took the initiative. © Paul Conrad/The Bellingham Herald – Will Beckman and Cale Simms lead the course toward the last marker in the second race of the FJ division of the annual Bellingham Youth Regatta on Saturday afternoon August 9, 2014, on Bellingham Bay in Bellingham, Wash.
Another fortunate thing: I was placed on a boat with “The Two Bruces.” They were hilarious and gave me a few laughs. Their camaraderie was refreshing. The pilot Bruce made sure I was in the spot to get the shots I needed. Because of this I was able to get those tacking shots where the sailors really leaned over the side to make sure they didn’t tip over. 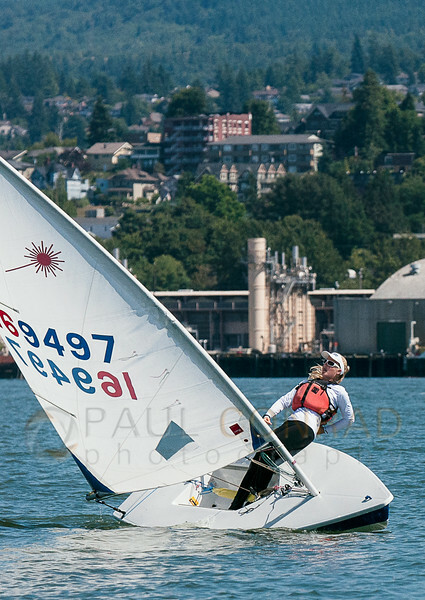 © Paul Conrad/The Bellingham Herald – Eliza Dawson of Port Townsend leans hard while tacking during the second race of the Laser class during the annual Bellingham Youth Regatta on Saturday afternoon August 9, 2014, on Bellingham Bay in Bellingham, Wash.
During the races, I noticed on sailer on a Laser Radial really able to complete a rolling tack by flopping to the other side of his boat. I paid close attention to him as he tacked his way towards the finish line. Sailor Drew Bennett really pushed hard to turn his boat. He went from one side to the other like a rabbit being chased by a fox. His technique was flawless. At one point, we all thought he may go a bit too far and end up over the side. 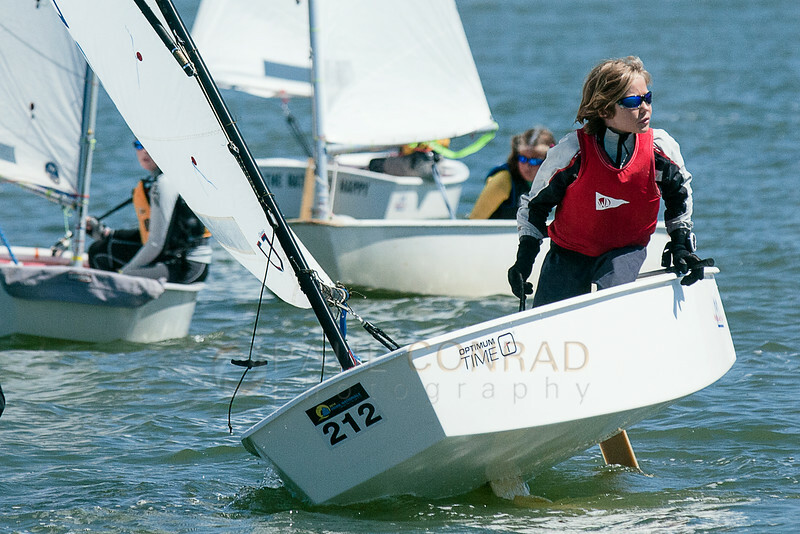 © Paul Conrad/The Bellingham Herald – Drew Bennett leans hard while tacking as he competes in the second race in the laser class of the annual Bellingham Youth Regatta on Saturday afternoon August 9, 2014, on Bellingham Bay in Bellingham, Wash. It wasn’t until I downloaded my images back at the herald that I noticed some shots I hadn’t before. I didn’t feel comfortable chimping through my images in a small rocking boat. My mind was more focused on shooting frames and staying steady. Plus the glare off the water made it impossible. 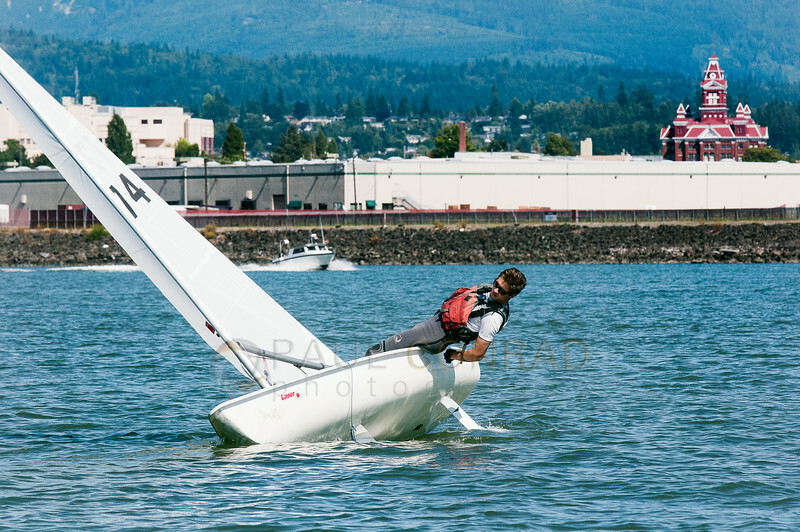 © Paul Conrad/The Bellingham Herald – Casey Pickett looks for an open spot as he finishes a rolling tack during the annual Bellingham Youth Regatta on Saturday afternoon August 9, 2014, on Bellingham Bay in Bellingham, Wash. I think the hardest thing to do was not only get in a spot, but also get a good exposure. It is the main reason in general why I shoot in RAW. I know the old, tired argument, but the reality is, RAW gives you more latitude and for all intents and purposes, you just get a more workable file. © Paul Conrad/The Bellingham Herald – Youth in the Opti racing division begin their approach to the finish line during the first race of the annual Bellingham Youth Regatta on Saturday afternoon August 9, 2014, on Bellingham Bay in Bellingham, Wash.
Case in point: the ability of the camera to record detail is greater than what it will write in a jpg format. This shoot made it necessary as the Sun glinting off the waves would trick the meter. And for me to combat the tricky light, I shot on manual using the good ol’ Sunny 16 and underexposed by one stop. For the images, I used my 80-200 exclusively. There was no need for me to bring my 17-35, but I had it in case. I really should have shot a few photos of The Two Bruces for this blog at least. Without their help, the shoot would’ve been impossible. 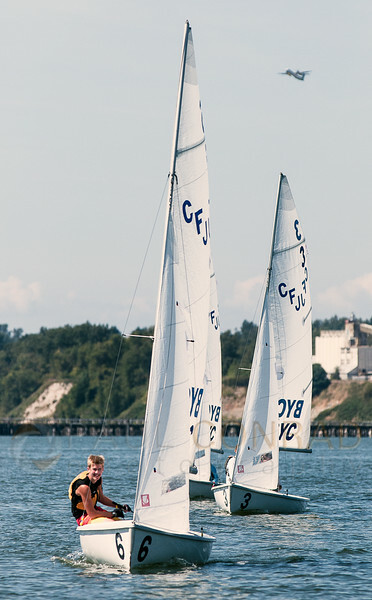 © Paul Conrad/The Bellingham Herald – A plane takes off from Bellingham Airports as Will Beckman and Cale Simms (hid by sail) lead the course in the second race of the FJ division of the annual Bellingham Youth Regatta on Saturday afternoon August 9, 2014, on Bellingham Bay in Bellingham, Wash.
More images can be found on The Bellingham Herald’s website at 2014 Bellingham Youth Regatta.